Currently there are no approved vaccines or specific therapies to prevent or treat Zika virus (ZIKV) infection. 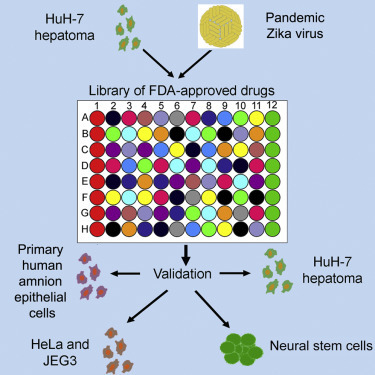 We interrogated a library of FDA-approved drugs for their ability to block infection of human HuH-7 cells by a newly isolated ZIKV strain (ZIKV MEX_I_7). More than 20 out of 774 tested compounds decreased ZIKV infection in our in vitro screening assay. Selected compounds were further validated for inhibition of ZIKV infection in human cervical, placental, and neural stem cell lines, as well as primary human amnion cells. Established anti-flaviviral drugs (e.g., bortezomib and mycophenolic acid) and others that had no previously known antiviral activity (e.g., daptomycin) were identified as inhibitors of ZIKV infection. Several drugs reduced ZIKV infection across multiple cell types. This study identifies drugs that could be tested in clinical studies of ZIKV infection and provides a resource of small molecules to study ZIKV pathogenesis. People are under the impression that the ZIka virus is newly discovered. Wasn’t the Zika virus patent applied for in 1948 by the Rockefeller foundation?